The federation introduced the Doug Clarke Memorial Award in 1982 in memory of Dr. C.H.D. “Doug” Clarke. Dr. Clarke devoted his career to the philosophy, science and art of wildlife management throughout the world. At the time of his death in 1981, he was a director of the Canadian Wildlife Federation. 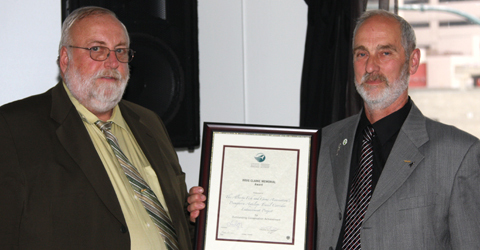 This award is presented to a Canadian Wildlife Federation affiliate for the most outstanding conservation project completed during the previous year by the affiliate, its clubs, or its members. Any conservation project that was completed during the previous year by any Canadian Wildlife Federation affiliate, its clubs , or its members is eligible for this award. To be eligible, a project must be submitted by an affiliate. Details of a project must include a concise description of its purpose, activities, extent of participation by individuals, project costs and duration of the project, results achieved and a summary of how the project benefited wildlife.